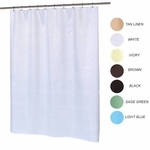 Shower curtains come in several styles, lengths, and fabric materials. Choosing the right one for your shower or tub installations takes just a couple of easy steps prior to making your purchase. You will need to measure the length of your shower curtain rods and the length of the rod to the bottom of your shower floors or tub bases. Next, determine if there is adequate lighting inside the shower once a curtain is up. Then, you just have to decide what curtains you want for your hospitality business from a shop bathroom wholesaler. Standard fabric shower curtains are available in either light or heavy weight waffle weave polyester fabric that is washable. You can choose from a variety of solid colors. These typically measure 72” wide x 72” long. You can also get a curtain that is extra long at 78”. You will need either metal or plastic rings or hooks to hang from the rod. You may also want to have a shower curtain liner with a fabric curtain. Decorative striped standard shower curtains can add a pop of subtle color to your bathrooms. These are typically 70” wide x 72” long and are very popular. You can use these with or without a liner. If you prefer window curtains to allow for more light into the shower, consider getting a heavy gauge vinyl curtain. The bottom half is opaque, while the top half is clear as a window. These are available in a variety of sizes: 72” wide x 72” long, 72” wide x 78” long, 72” wide x 84” long, or 54” wide x 78” long for smaller stall showers. You will still need the hooks or rings to hang these curtains. You might prefer curtains that don’t require any hooks or rings. EZ On curtains are perfect for this because they have built-in shower rings that easily snap on to the shower curtain rod. The EZ On curtains is 100% water repellent so that you won’t need liners. They are available in solid, striped, or circle patterns. EZ On curtains are 70” wide x 72” long.